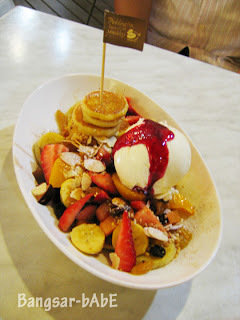 After dinner, we went to Paddington House of Pancakes for dessert. 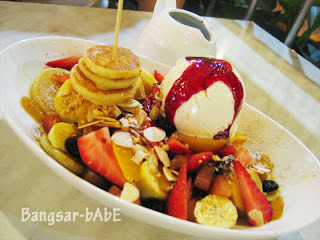 They have an extensive menu with all sorts of pancakes you can imagine; both savoury and sweet. We went straight for the Treasure Box as a friend said it was really good. Mini dollar pancakes with sliced strawberries, bananas, peaches, plums and raisins. MmmMmmmm…. Topped with almond flakes and a generous dusting of cinnamon and ice cream, it was superb with the very thick maple syrup (or was it golden syrup?) that came in a small jug. 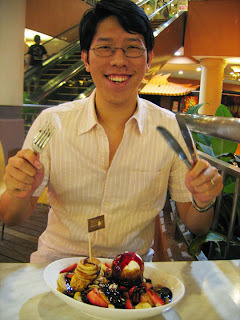 *ok…I could be a bit biased as I ABSOLUTELY love pancakes*. Serving was pretty huge so it’s best to share. 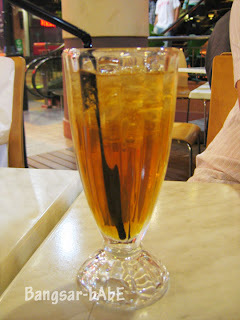 The ice lemon tea was a too diluted. They need to work on their beverages more. 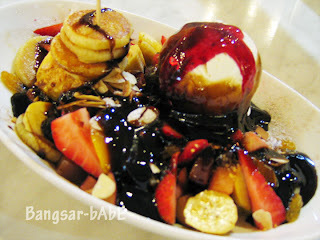 The bill came up to RM 25.88 after tax and service charge. Verdict: Delicious fluffy pancakes, extensive variety and pricing that’s slightly on the high side.